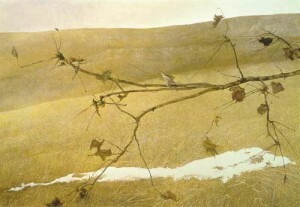 Andrew Wyeth passed away this weekend. Modernist? Expressionist? Kitchmeister? I can provide no insight into these epic art-world squabbles other than the fact that I enjoyed his work immensely and “Christina’s World” gives me a serious case of the creeps. Heck even muppet parodies of “Christina’s World” give me the creeps. Regardless of the debate about his merits (and I even think his later work, is absolutely fascinating) there are very few contemporary artists the general public know at the drop of a last-name reference, and he was certainly one… even if I can’t bring myself to post “Christina’s World” as the thumbnail to this post.